Sometimes travelling is hard work like the day we travelled to Manila from Puerto Princesa. James was back from the dentist and our flight was scheduled for 3:40 pm. We had already had a message that the flight would leave an hour late. It was also stipulated they wanted us at the airport 3 hours before the flight!! This is a domestic flight we’re talking about. So thinking ok we’ll not have lunch and grab something there we arrive at the ridiculously asked for time and guess what? It’s delayed again and then again! We ended up at the airport for 5 hours before we got on the plane. We had decided to stay close to the airport and are glad we did as traffic in Manila is horrendous. Our stay was at Alicia apartments less than a kilometre from the airport and as only opened four months ago was although fairly bland was comfortable enough. We were a little weary as it was clearly in a shantytown village. Luckily the new presidents extremely hard stance on crime has cleaned up the city considerably and violence seems to be at an all time low. No beggars and we were once again impressed with the friendly locals. For our one day in Manila we took the advice of several Filipinos we met and took an Uber into Intramuros which means inside the walls. This area has some of the buildings from the Spanish era here and there were quite a few that were reminiscent of our visit to Cartagena on our cruise. We took a horse and carriage ride for an hour and got some great ideas of where to go for the rest of our day. We went and visited gardens, the fort and museum of Jose Rizal. Had a yummy lunch and walked through lots of character full streets. Not sure if there’s a building code here or not! I’d say it’s a safe guess NOT, when you see some of the structures around. It’s truly surprising they are inhabited by families and trades and haven’t fallen over in a domino effect. It was a great end to our month here and we left the next morning with one million photos and great memories. We didn’t have to catch the ferry from Coron to El Nido till midday, so we had a nice lie in before packing the bags! I had a minor meltdown when I couldn’t find my credit card stash, but found them right where I had put them, remembering at the time that I’d probably forget that I’d put them there. We’ve bought a few things along the way, snorkeling gear, drybags, (which have been the Best Buy with all the trips on the boats and on the back of the scooter on wet days),reef slippers and I bought a new sun hat to replace the $60 US Panama hat that was supposed to be a buy one hat last a lifetime buy! Pfft lasted a month in Bali just. My new hat cost the equivalent of $4 Aus. Trying to squish the extra in the bag is getting harder, but we manage somehow. After packing we decided to shout ourselves a great Aussie breakfast at buzz, where we met a nice couple from Newcastle probably about our age. The ferry had reserved seating and movies playing so the almost 4 hours passed quite easily and we were snaring our first glances of El Niño before 4pm. The entry in is awesome and in fact the whole trip we were surrounded by islands making it a very visually interesting trip. ElNido is a more lively town than Coron and caters for the young tourists with lots of eating and drinking places. We instantly loved the vibe and are excited to discover this new town. We got a tricycle to our hotel The Columbus Inn (strange that we will be sailing on the Columbus ship in February ) we were thrilled to discover that although not expensive it was far far far better than our Fawlty tower experience in Coron. The view out the window is worth it alone. After unpacking we grabbed a tricycle back into town, our hotel is in Corong a few kms out of the ElNido town. The tricycle driver dropped us at a restaurant he thought we’d like and we did. And as we’d only had breakfast did justice to the food and drink we ordered. After a stroll around we headed home as we had a boat tour booked for the next day. 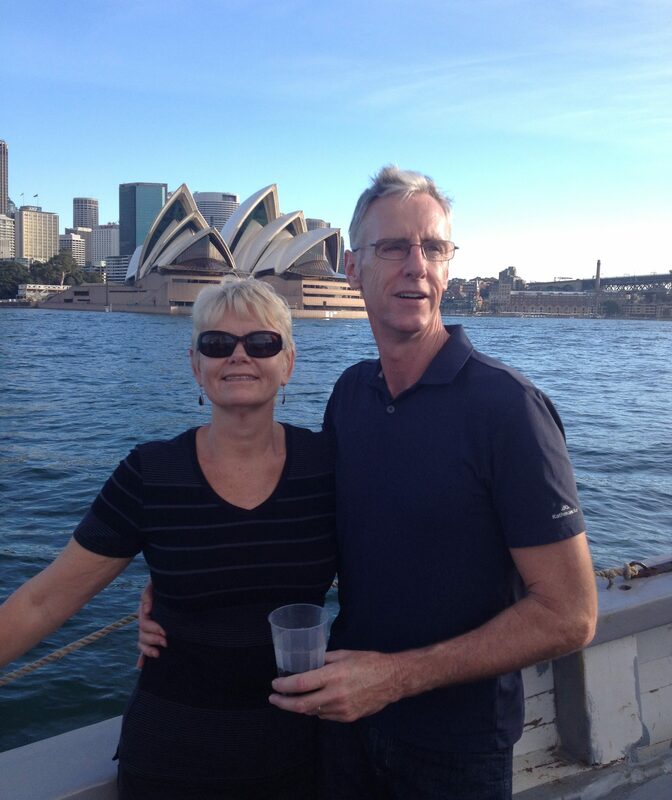 For our first trip we picked tour A one of the two that are highly recommended. To be honest we had a great day but felt it wasn’t as spectacular as the ones we had done in Coron and way more boat/ people traffic. Saying that we did still enjoy the day mixing with the other people on the tour. After a shower we decided to head into the town of Corong to look for dinner and buy a few supplies. James had seen an Italian restaurant as we came off the boat trip and we went to check it out. 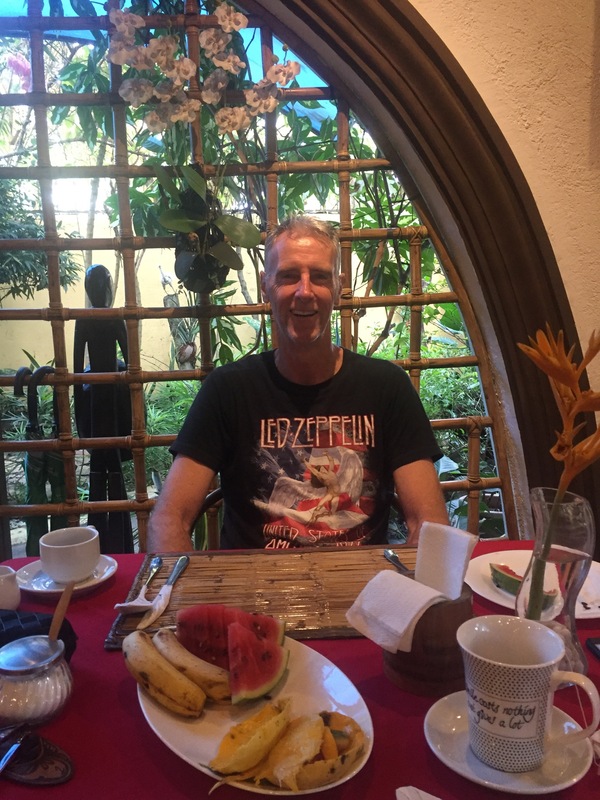 So glad we did, had probably the best meal we’ve had in the Philippines and the wine was the cheapest we’d seen here ever, and was excellent. It was the first wine we’ve had here in Palawan as cocktails are cheaper usually. We will definitely go back. We had a margarita each, a red wine each, I had a sofa water, James a bottle of plain water, we shared an entree, had a main each, shared a desert and James had an espresso and it was around $45 Aus. Ran into a young couple from our tour who also have recommended a French restaurant so somewhere else to check out. The hardest part about being in the Philippines is the lack of internet, it just either doesn’t work at all or too slow to download or google. That restaurant we said we’d go back to, try four nights in a row, to be fair we did try to go somewhere else but they were full. Not one evening were we disappointed with the food, drink or music at the restaurant, in fact the music was so good we asked the manager one night where he got it, he said just music he’s liked off the Internet, he told us bring in a USB stick and they can download it for us, which we did! We hired a motor scooter for two days after our first tour on the water and potted around going into El Nido and Dos Cabanos a beach near us. and we went off heading north to a waterfall. This was a great experience you hook up with a local guide, about $10 Aus for the two of us and then head off across farmers fields with cows, goats, pigs chickens all running free, cross over streams many times, walk through native vegetation and after around 45 minutes arrive at the waterfall with a beautiful cool refreshing pool to soak in before heading back. These waterfalls have not been commercialised yet with stalls etc and the track hasn’t been upgraded and I hope it stays that way. We booked tour B for our next on water adventure and we were pleased as it wasn’t anywhere near as busy at the stops and really quite stunning. On our tour today we had a couple from Canada and their 7month old son Rowan. What a happy little chappie he was and smiled all day. Palawan is a tropical paradise and there’s an amazing vista everywhere you look. It’s different from Bali, there’s not the infrastructure here yet nor the shopping except for wet bags, sun hats, snorkeling sets, reef shoes and a few tee shirts. Tour shops are everywhere and there are massage spas here as well. We booked a scooter again for our next two days and have booked tour C for Thursday 16th November. The first day with the scooter again we went into El Nido and were thrilled that the SIM card we had topped up in Coron but which hadn’t worked at all was suddenly working in town yay! We were able to book accommodation for our two nights in Manila before we fly out to Hong Kong, enjoy a lovely Mediterranean lunch overlooking the water, take the scooter to Dos Cabanos for sunset drinks and a swim before showering and heading back into Corong town for dinner at a restaurant for taco Tuesday with live music and margaritas buy one get one free, what a top day! Oh and if you didn’t bring your dog on holiday don’t worry the restaurant will let you adopt theirs to sleep at your feet or give a pat too. Our second day with the scooter we headed to Macpan beach. This is north from El Nido and we passed the waterfall guide stalls on the way. We had been warned once you get off the National highway that the track road to Macpan beach was boggy after heavy rains, But we went anyway and James did a brilliant job of off-roading riding with me keeping still on the back. Like everyone else who ventured there by bike we were mud splattered on arrival. 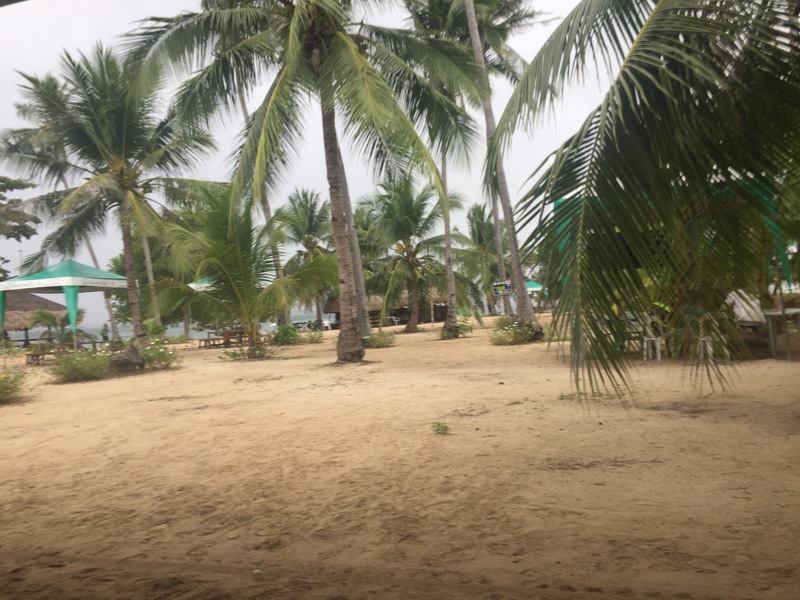 The beach is a long stretch of white sands, coconut tree lined beach front with lush green vegetation covering hills at one end and little islands dotted off the coast. The water is turquoise clear and warm enough to dive into but still refreshing. We hired a couple of sun lounges with an umbrella for $10 Aus for the day and settled into a day of reading, swimming and relaxing in this visual paradise. A couple of little native beach huts selling food and drinks supplied us with a snacking type of lunch, one thing we’ve loved about most of the food outlets here is if they offer fries, they are hand cut and soo delicious. It was a very happy couple who rode back through the rice paddies with the caribou working the fields with their owners, passing little townships and passing tricycles with sidecars with their livestock of a couple of pigs in each. 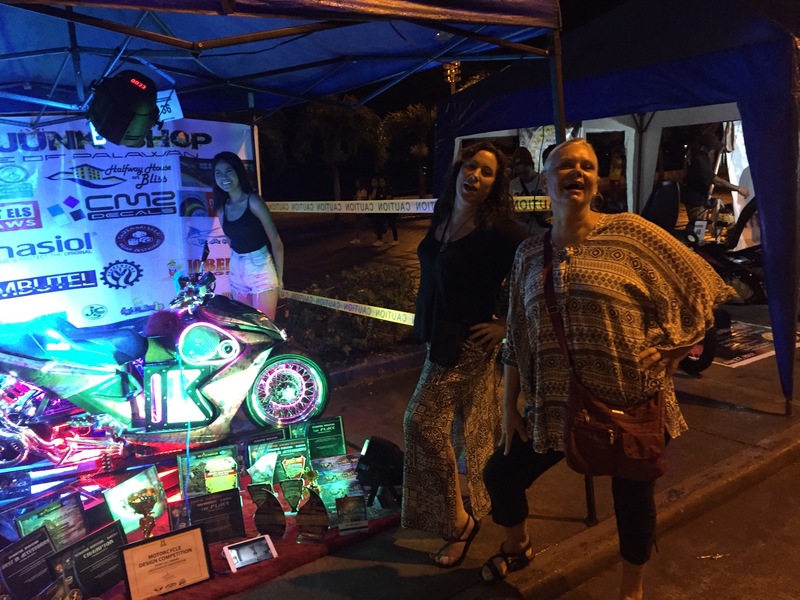 The more we stay here away from the big town of Puerto Princesa the more we are falling for the charms of the Philippines. Of course we ended our day with a shower, had to wash the motor scooter too as was dripping with sloshy mud, had a little nap then headed to our favourite restaurant for some more of their sensational pasta. Thursday the 16th is tour C Island hopping day. We wake to the sound of roosters every morning and then the little chirps of the baby chickens scratching around in the vegetation at the back of our accommodation, we are snuggled into a hillside here with about 50 steps up to our 2nd floor room (hence the great views). 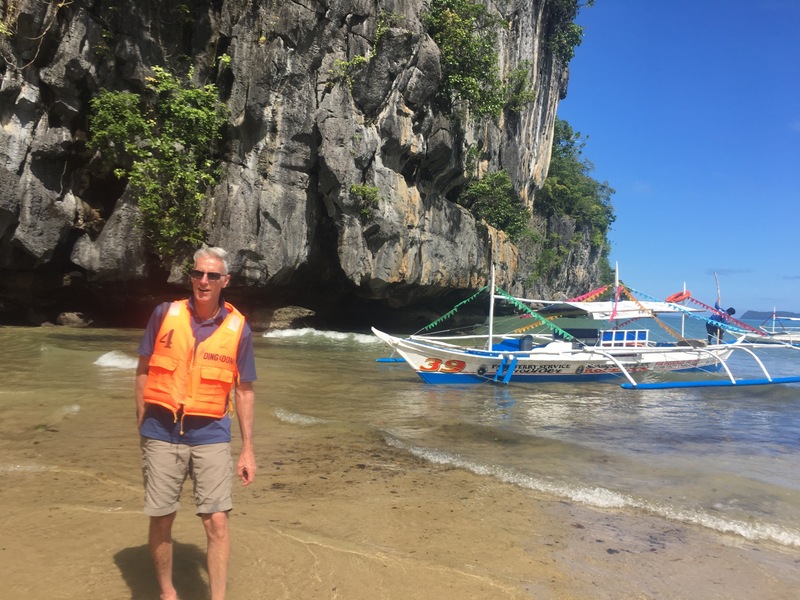 Tour C was a great day and our pick of the tours here in El Nido. Another great day mixing with people from all over and we met some totally great ex pat Filipinos living in California for the last 37 Year’s. Will definitely be looking them up when we’re over that way. Great locations with an awesome reef for snorkeling and excellent company made for a great day. back home for a shower and back for a pizza at our favourite restaurant. Another brilliant day. Having booked the scooter for the next few days, we were hoping to get up to Duli beach but the first day we woke up to torrential rain and we relaxed, reading and dozing off again till midday. Headed into El Nido for lunch and ran into Carlos and Mina, a gorgeous young couple whom we keep running into, Carlos invited us to join them and some other young travellers at the bar for drinks, we had a great time chatting and exchanging tips and stories. Thanks for making our day. Saturday the 18th November and second day with scooter again, still not looking like a beach day so we decided to head south and just see the countryside. In the end we rode to TayTay a seaside town with a fort, huge Catholic Church and lots of markets. We spotted one other non Filipino there and we did stand out a bit, but everyone is friendly and we found a Pensione that had a restaurant for lunch. As we were leaving a truck with army soldiers came in for lunch. They were all carrying massive automatic rifles AK47 style. If they hadn’t been smiling and said Hello would have been really intimidating, well it probably still was a little to be honest. The loveliest part is waving to all the smiling kids as they wave to you as you ride past. Even older people wave to us, young folk on backs of trucks even (probably wondering what Lola and LoLo are doing). Back home we had hot showers as we had plenty of rain on the trip, luckily we had taken our raincoats. We went into El Nido to pick up the USB stick with the music on from the restaurant manager (they have several restaurants), the town was heaving with people and the busiest traffic we’ve seen here. Went back to our favourite restaurant and couldn’t believe just as we were finishing up Carlos and Mina walked in. It’s bizarre how that happens, this isn’t that small a town. They were out celebrating Carlos’ birthday. Our last day in El Nido and the sun was shining so we decided to spend the day at Dos Cabanos beach, we got there early enough to score free sun lounges(with cushions) and spent the day reading,swimming,eating and drinking. That night we headed out for our last dinner at Tratoria Altrove. The staff gave us a warm welcome and even the manager was there and came over to say goodbye and thanked us for our custom. Off course we ran into Carlos and Mina again up the lane way and another of the couples we’d met came into the restaurant for dinner. That’s what we love about staying longer, you make a connection to places and with people. Our van trip to Puerto Princesa was fairly gruelling considering it was air conditioned, they squeezed too many people in and it’s a long 6 hours from being picked up from our hotel. Never mind we arrived at Floral Villarosa along with another couple on the van and enjoyed the well appointed room and hotel. Next day Tuesday 21st James got his tooth work finalised and we flew to Manila for our last two nights. Like all good plans, sometimes things don’t quite go quite as expected. Then you have to improvise and make it work. So we arrived at the Port at 9:30pm on Wednesday to be turned away. The ferry hadn’t arrived due to a typhoon off the coast of Coron where we were headed. So back to our hotel Floral Villarosa to see if they had a room for the night. We have extended our stay here several times which has required us to move rooms and this time we were able to get another room upstairs. We ended up booking it for two nights as we weren’t going to catch the ferry till late the next night with a 1:30 am Thursday sailing time. The staff here are fantastic and have really looked after us, helping with phone calls etc whilst we find out what’s happening. Anyway we arrived at port around 10pm the next night as requested and were pleased everything was going ahead. It was interesting to watch all the shipping containers being loaded on. This is a goods ferry as well as for people . We opted for a private cabin, there aren’t many on the ferry but seeing that the alternative is either share a cabin with 2 strangers or sleep in the main sleeping area with 100 or more others in bunks and little facilities we took the more expensive option. At 5000 pesos around $130 Australian we decided it was great value. We actually have our own bathroom and there is a set of bunks as well as the queen size bed.oh and a window! Or porthole I should say. We were pleasantly surprised that they had a nice area at back of ship on top with a bar and live music, and the singers were fantastic. People were writing them requests with a little thank you money so it was very entertaining. Back in our cabin, with a seasick pill just in case,I slept right through the night and the ferry is so smooth it’s only the engine vibration you can feel. Just as we were going to sleep there was an announcement with a prayer for a safe trip. And at 6am we were woken with a prayer for the new day and there was a prayer when we arrived as well. Our tickets include breakfast and lunch and as stateroom guests we went to the Horizon cafe for our breakfast early the next morning as it was served between 7-8 am. James had coffee and I tried one of the two options forgoing the hotdog sausage (now I know why there is so much refrigerated space allocated for them at the supermarket, it’s a staple breakfast item). To be fair if the chicken and rice served had been hot it would have been quite an enjoyable meal, but cold and served so early I could only manage a few mouthfuls. Looking forward to see what lunch offers, there’s a little kiosk which sells noodle bowls, just add hot water and you’re laughing, so that’s our backup meal. People have bought all sorts with them on the ferry and quite a few will be going onto Manila. There’s roosters,dogs and potted shrubs and massive boxes of goods. Again we seem to be the only non Filipinos on board. Most tourists do the van to ElNido and fast ferry onto Coron before flying back to Manila. 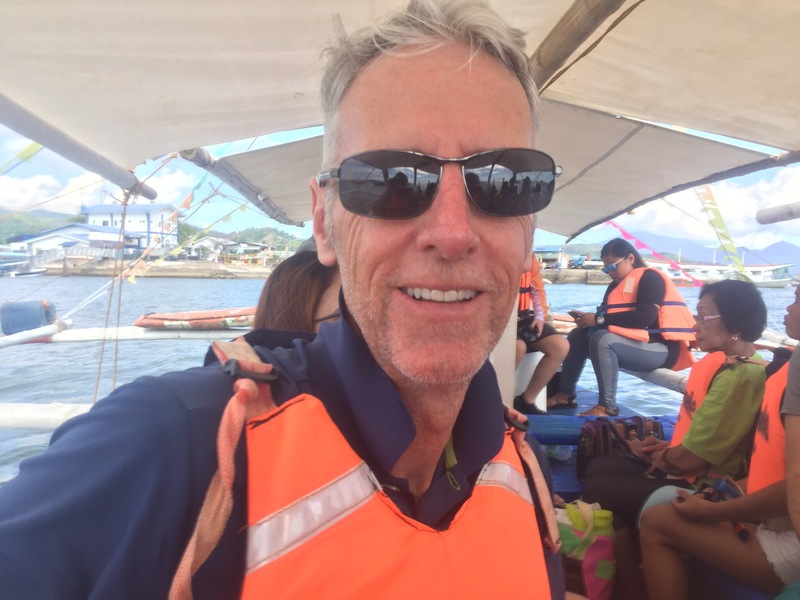 We decided on this option as we need to come back to Puerto Princesa for James tooth repair, but if the impression wasn’t any good and we weren’t going to come back, we were going to be able to fly out of ElNido for Manila. With the ferry only twice a week from Coron, making ElNido our last stop meant we can get a van back to dentist in Puerto Princesa any day of the week. (Hope you can understand all that). Anyway back to the travel log, we made it to Coron and hopped on a tricycle to our hotel. The tricycles here are a little different and also have a rear cabin so to speak with bench seats so easy for piling our luggage in and the two of us. From the outside the hotel GMG looks like a fairly nice establishment in the hub. But the reality is it’s Fawlty Towers Philippine style. The pub over the road is called No name, but the GMG hotel should be called No idea. It’s so farcical it would be funny if it just wasn’t soooo bad. The free wifi, well you can connect but nothing happens. The included breakfast is practically nonexistent. The room would appear ok but has a bad damp smell, sheets that a too small for the bed, see through towels that seem to be made of Teflon, dust etc. then there’s the bathroom so manky, I had to insist on them cleaning the mound and mildew off the walls while we went out. We would have left if we hadn’t booked ahead with a travel agent, paying in cash on non refundable booking. To be honest this is not how we normally book accommodation and we only did it as at short notice there wasn’t a lot available. We certainly thought it sounded ok and the pictures looked ok and it wasn’t that cheap. Certainly more than our hotel in Puerto Princesa so thought it would be fine. Well the good thing about bad accommodation is that it makes you go out A LOT! And we actually enjoyed all the tours we did immensely. You come to Palawan for the scenery but mostly for the stunning waters. And Coron certainly delivered in spectacular days out on the water, this is really the place if you love snorkeling and diving and white beaches with tropical outlooks. 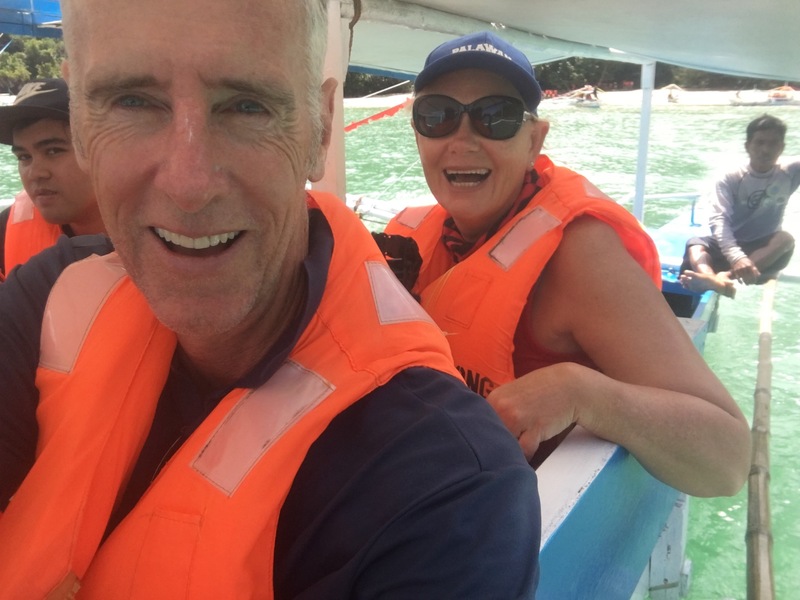 We had four days on the water tour A, tour B, reefs and wrecks, and an escapade trip. If you were here on a limited time we would suggest tour B. We also did an afternoon town tour which was fun going with people and we had a few laughs, the highlights were climbing the 721 steps to the top of the hill behind the town where the big cross and sign for Coron are located, we caught the sunset there and then onto the hot springs which were very hot around 41 degrees and good for those muscles we just gave a workout on the hill climb. The springs have a beautiful setting at night. We were in a van and I know our friends the Porters did it in a tricycle, I know why Mel said it was scary. We’ve had some bad food here and some excellent food, check out “ buzz express”for good coffee, even do a flat white, big breakfast, and great meals at night. Its pricier than a lot of places around $30-$40 for two meals with a cocktail, but worth it. You can get fried rice for around $2 at some places. Something we’ve discovered is Turon banana wrapped in spring roll wrapper and deep fried, delicious!. Beer is cheap especially at happy hour $1.25 and cocktails too, around $4-$5. What we have enjoyed is mixing with all the people on the tours. We are usually the oldest but we’ve met people from the Philippines, Taiwan, USA, Canada, Iran, Uzbekistan , Poland, Norway, Spain, England, Slovenia, Russia. 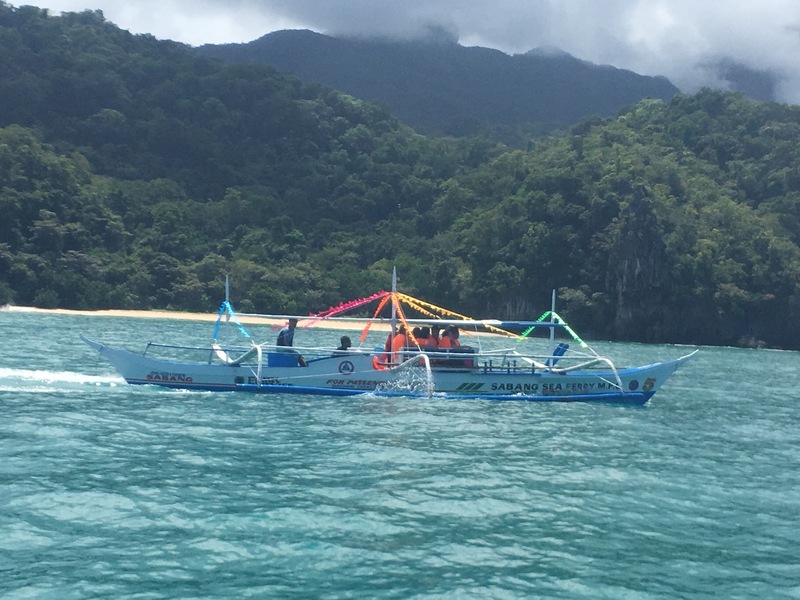 Our next adventure is the fast ferry to El Nido where we have 11 nights booked. it’s only four hours from Seoul to Manila and another one and a half hour flight from Manila to Puerto Princesa our first stop in the Philippines BUT! 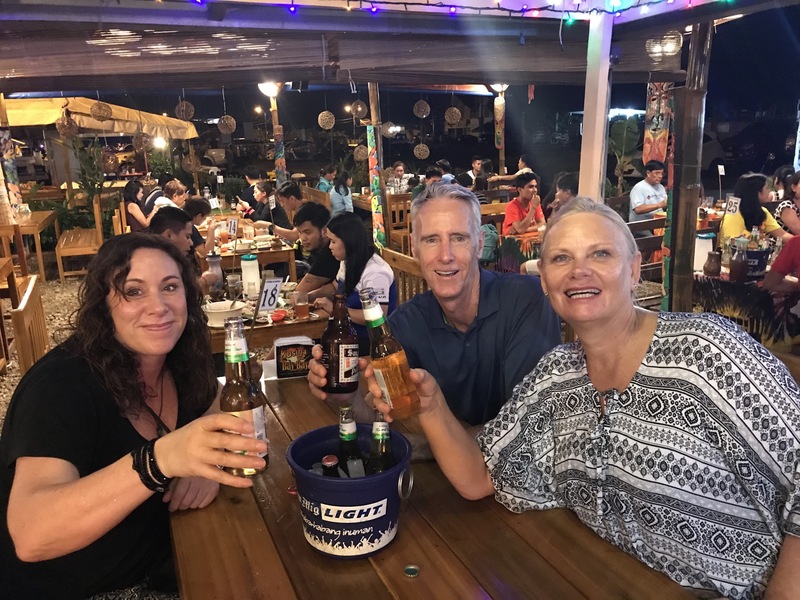 it took us almost two days to do this travel.We had breakfast with Andrew Tuesday morning in Songtan ( poor JungWon was back at doctors, she had originally taken sick a few weeks before in Brisbane,tonsillitis). Andrew drove us to the bus stop and we took the 11:15 bus to Incheon airport. We just missed the hourly shuttle to our hotel so had a coffee at the airport before the next shuttle. The hotel had been refurbished since our last visit and was extremely comfortable, a nice last night for our South Korean stay. We reorganised bags and tested weights as we were to be on strict restrictions from Manila to Puerto Princesa. Had a lovely curry and a couple of reds for dinner and set our alarm to make sure we would make the first 6am shuttle to airport our 8am departure to Manila using Philippine airways. 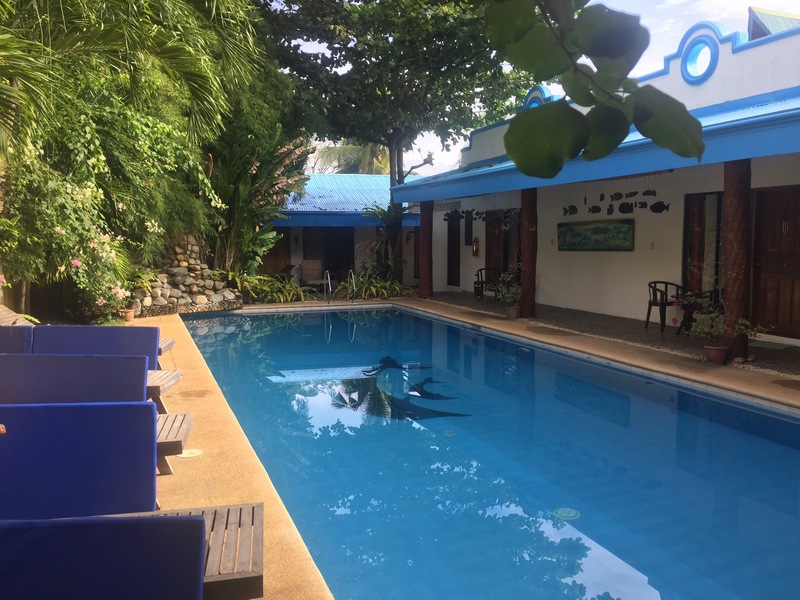 We had a long wait at Manila for our flight onwards and it was around 7pm that we arrived at Floral Villarosa our hotel for our stay in Puerto Princesa. This is a lovely little complex, around 11 villas with a great garden and pool. The staff are fabulous and all would be perfect if it was just closer to town. 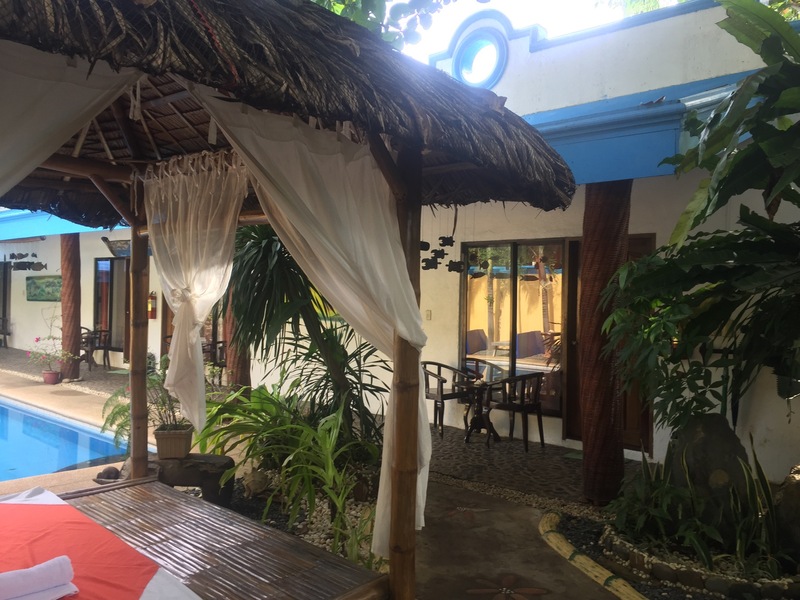 This was going to be a fairly quick four night stay, to unwind and settle into Filipino culture, do a few day trips and discuss our next move. However James dental work has required us to stay a few days longer and then a return later to finish it off. We’re waiting to see if the impression taken and flown to Manila is ok, if not another impression will need to be done. The dentist James found online came with some good testimonials and was listed as Vanilla smiles. 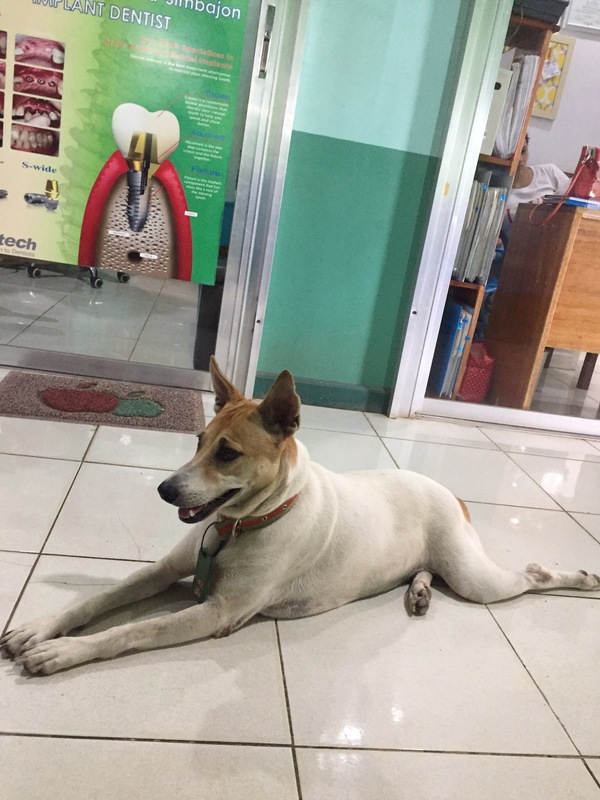 In fact when we arrived there was no sign for vanilla smiles and we were at a community hospital where doctors each have their own “shop” we did found the dentist (still no sign for vanilla smiles,but they were expecting James). NEVER NEVER COMPLAIN ABOUT THE HEALTH CARE WHERE YOU LIVE. That’s not to say they don’t have good medical practitioners here, just that they’re working under hard conditions. It was two hours before he came out and we were happy to get a tricycle home. A tricycle is a motorbike converted to accomodate up to five people. Every ride around here is 50 pesos around $1.25 Australian. We had gone into the town a bit earlier and found the SM shopping Mall. A 21st century western style shopping centre that was to be honest a welcome sight. It’s hard to say BUT sometimes it’s just nice to find something totally familiar somewhere you wouldn’t expect it, that’s all I’m . We found out a few days later that it only opened last month. We have had breakfast and dinner every night except one at our hotel as there really isn’t any other options without going into the town centre, too far to walk so we’ve been extremely happy that the meals served are of a good variety and cheap enough. It seems most people staying here are of the same mind and we have all chatted along happily swapping tour advice etc. We’re happy to see that quite a few have been our age group. Our first full day saw us having a walk around the area around the hotel and quickly realised that there’s not a lot to do here without getting a tricycle somewhere. So after our trip into town and dentist we were back to hotel for a swim in the pool and relax before dinner. We decided on a Honda Bay tour for our second day and the hotel organised everything, they’re very good. We were picked up in a comfortable van and joined a great group of people for our days outing to three different beaches for snorkeling, swimming, with lunch included. We visited starfish beach, Luli beach and Cowrie island. Cowrie Island was our last stop and the one marked for just swimming and sun baking or sleeping, there are beach massages available and a bar serving very reasonably priced drinks, about $4 for a frozen margarita or daiquiri. Unfortunately when we arrived so did the rain. 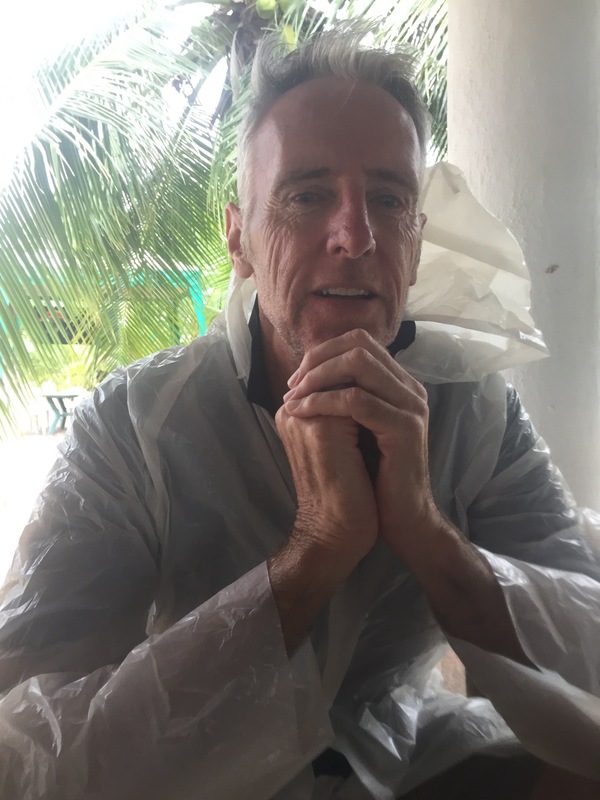 However we enjoyed a drink and sat out of the rain after having had a great day already with some good snorkeling.I had taken a seasick tablet and was fine all day, so I was happy. 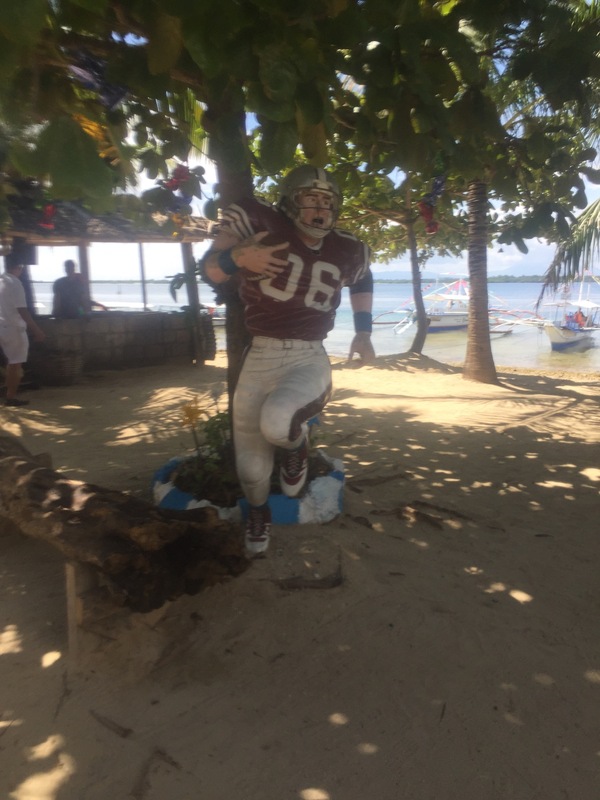 They had quite a few of these life size sculptures of people, some we recognised, Beyoncé, Hulk Hogan, and others we didn’t, like the football player, golfer, surfer dude, but it added a bit of fun to the place. Everyone on the tour was lovely, and we had some great chats about where people came from, one couple she was from Uzbekistan and he was Iranian, but they met in Japan and both did their University doctorates here in The Philippines and now live in Colorado. Anyway everyone waved each other off at the end of the day thanking each other for the good company and wishing safe travels each other. Our third day we were thinking of just relaxing poolside but after our breakfast the rain started and we decided to go to the mall and pick up a few toiletries we were running out of. We were mooching around in our room reading when our neighbour kiwi Kate knocked on the door and asked if we wanted to go out for dinner, she had a few choices and we decided on the Baywalk for dinner. This is an area by the port where pop up seafood restaurants open at night. We couldn’t say yes quick enough. The poor tricycle all but died with three European sized people in it. Much to our surprise and pleasure there was a scooter show and shine competition on. These scooters were their owners pride and joy and several had the prerequisite showgirl on their stand. Kate and I tried to do them out of a job with our showgirl pouting skills (don’t think we will get a call back somehow). Our dinner wasn’t that great and it was really down to thinking a set menu with different tastings would be great value when we should have just chosen a fish and a few of the magnificent looking tiger prawns and had them grilled. Oh well the conversation and company was great and the atmosphere tops. 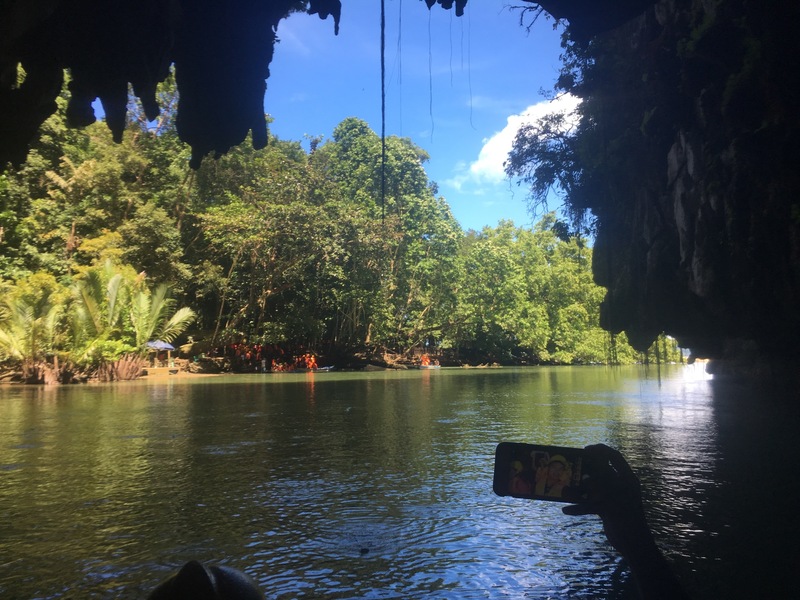 We have booked a tour of the underground river tomorrow (Sunday)and there is also a city tour you can do so may do that Monday afternoon. 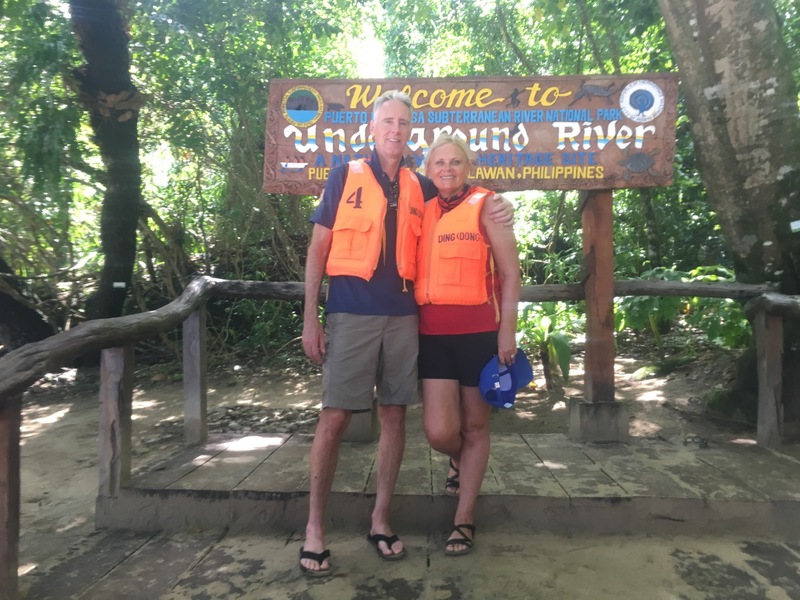 Well we had a fabulous day at the underground river, a unesco site and one of the new seven natural wonders of the world. The drive was extremely scenic and reminiscent of Bali with its coconut trees and rice paddies. The exception being NO RUBBISH littering the countryside. There is a fine for first two offences then a higher fine and six month Gail term for a third. Clearly working. It also had a look of French Polynesia with its mountain ranges as well. It was delightful to be part of a group where we were the only non Filipinos to enjoy this incredible day. 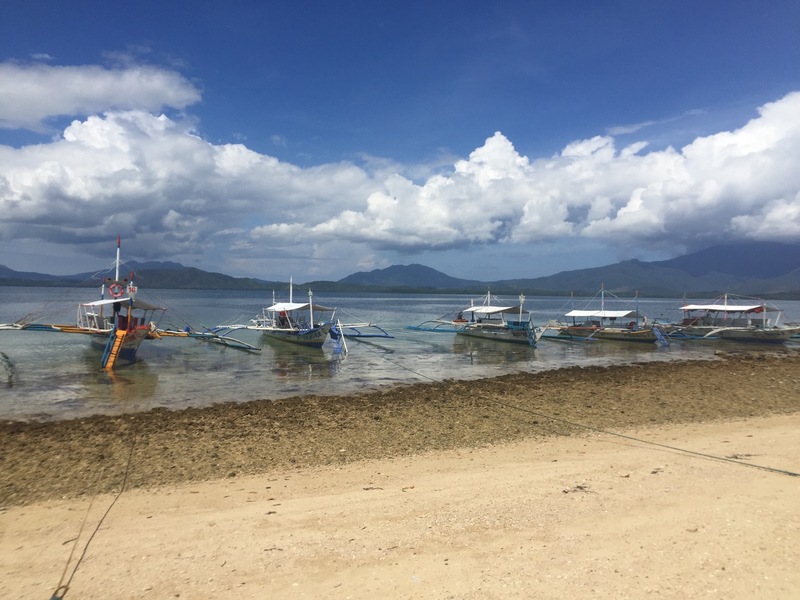 We arrived at Sabang harbour and distributed into outrigger boats for the trip to the beach where the underground river begins. 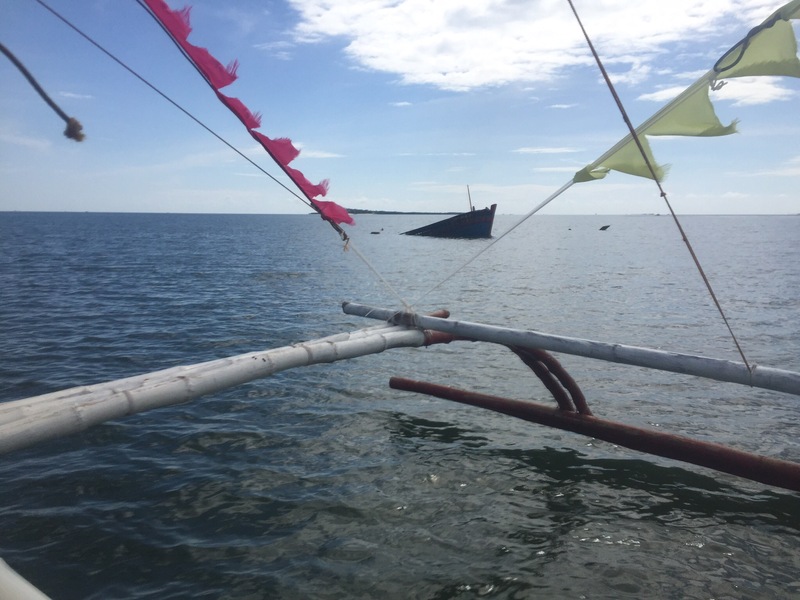 The strict conservation regulations put in place have kept this area pristine and I congratulate the Filipino community for their strong stance. It’s like a lost paradise and the trip through the river is one we will remember as a highlight of our time here. It’s breathtaking and I can’t recommend this trip highly enough for anyone visiting this area. 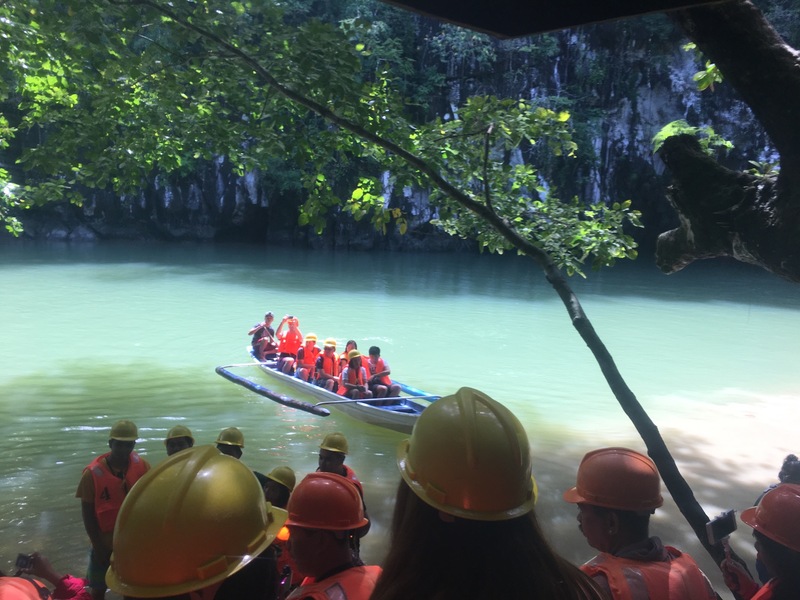 Once at the beach you walk through the forest to an area where you are given a safety helmet along with the life vest you have been wearing since the Sabang harbour and into a boat with a guide with a strong torch and the tour begins. They warn you not to open your mouth and go WOW as the cave is inhabited by bats and you could get a mouthful of bat 🦇 pee. They also ask everyone to not talk and not touch anything to keep it pristine for future generations. This allows for a beautiful serene and awesome experience where the headphone guides you are each given relays all the information you need as the boatman glides you through the one and a half kilometres that tours take you. The river is in fact over 8 kilometres but that’s restricted. Not a bad thing for preserving something so special. The stalagmites and stalactites and other rock formations including cathedral sized areas just showed why this has natural World wonder and unesco listing. Photos didn’t come out so well but we will remember it forever. Lunch was included and at around $55 Aus great value. We did indeed book the city tour for Monday afternoon. Another thoroughly enjoyable day as yet again we were the only non Filipinos on the excursion. It’s been great to talk with everyone and laugh and enjoy our tours together. The stalagmites and stalactites and other rock formations including cathedral sized areas just showed why this has natural World wonder and unesco listing. Photos didn’t come out so well but we will remember it forever. Lunch was included and at around $55 Aus great value. We did indeed book the city tour for Monday afternoon. Another thoroughly enjoyable day as yet again we were the only non Filipinos on the excursion. It’s been great to talk with everyone and laugh and enjoy our tours together. 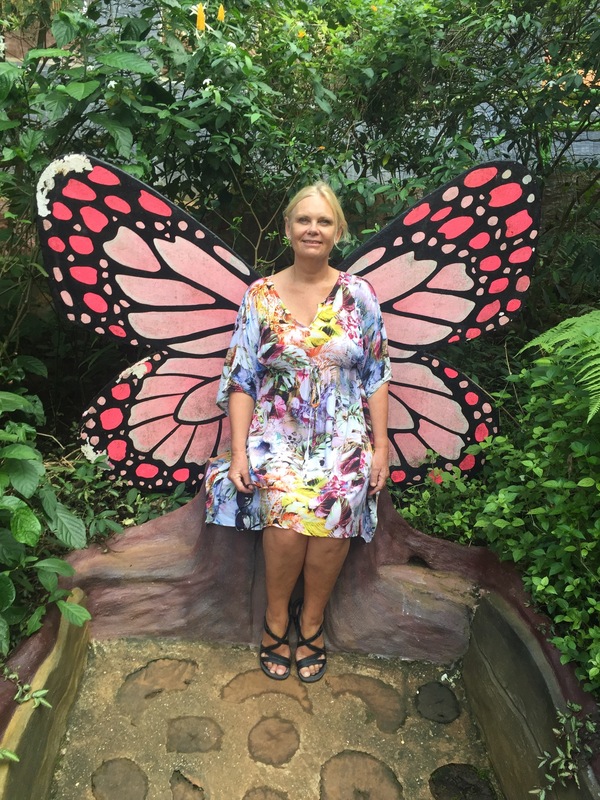 I think the highlight was the butterfly eco garden and tribal village. We were guided around by I’m quite sure a ladyboy who was as tall as James and so enthusiastic about what there was to see. 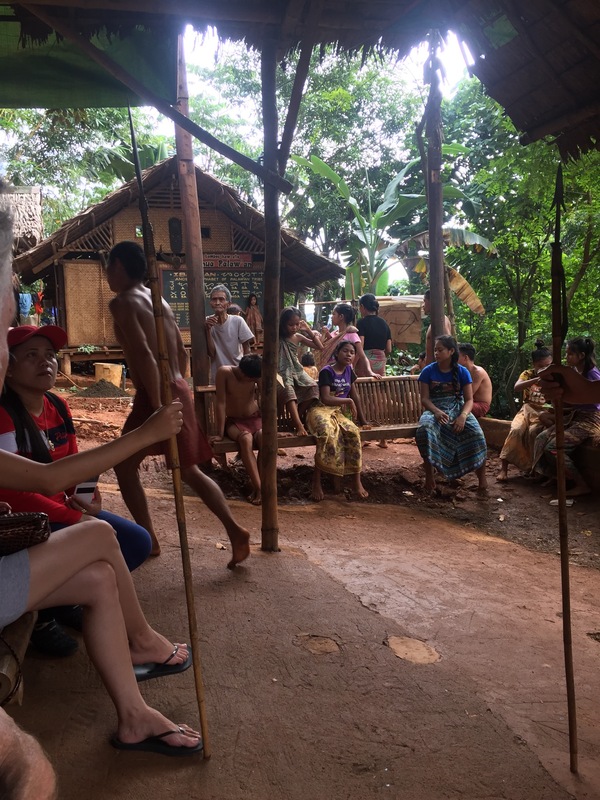 We saw beetles, scorpions, unique geckos, millipedes, crocodiles, butterflies etc but the highlight was the tribal village. This is a place where The tribespeople from the highlands come and stay, sometimes a few days sometimes a week or more and sell their handiwork and catch up with family. They also show visitors parts of their way of life. Musical instruments and singing, blowpipe demonstration, how they make a fire with flints, (if I go on survivor I’m taking one of these people). Anyway it was a very special time and they were truly lovely and friendly. And no big sell. They just wanted people to know about their culture. 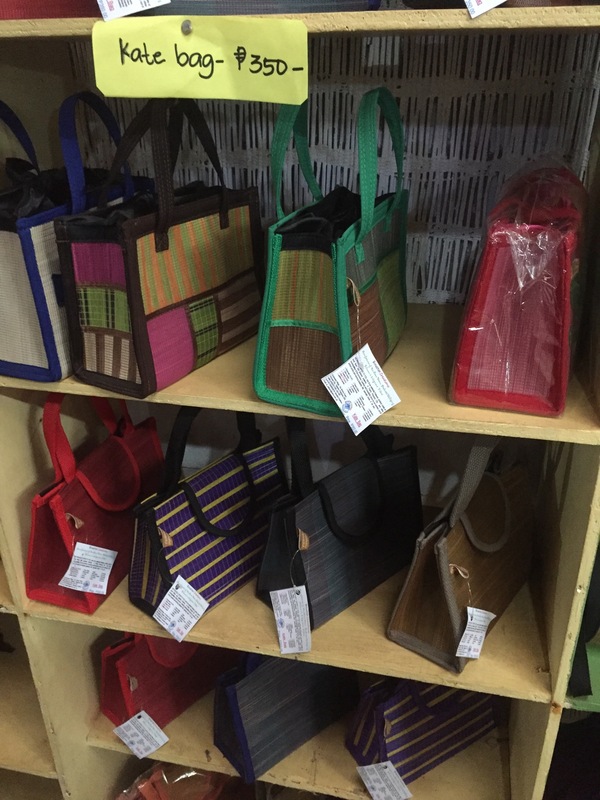 You could buy some of their handicrafts but there wasn’t any pressure. This is in the butterfly enclosure. 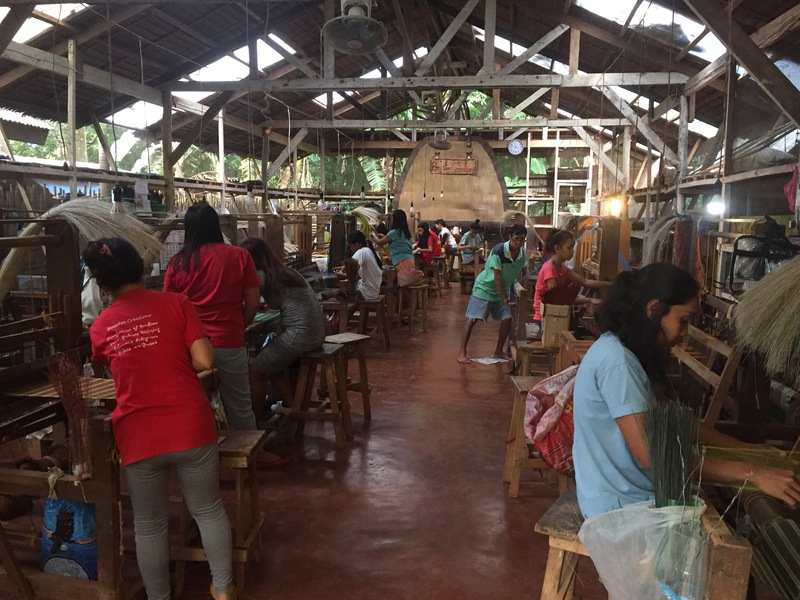 Another great sop was at Binuatan creations. 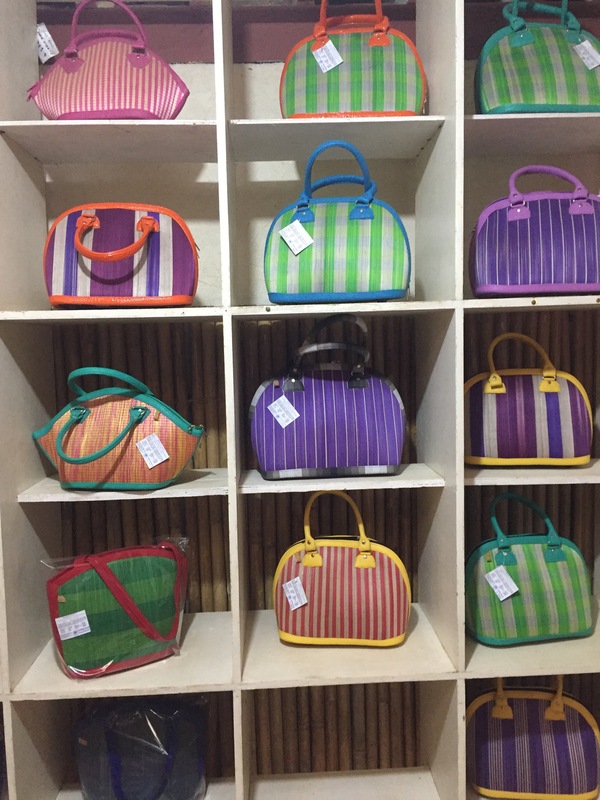 Here they make fantastic bags, wallets, lanyards, coin purses etc and you can all have a turn trying to weave. 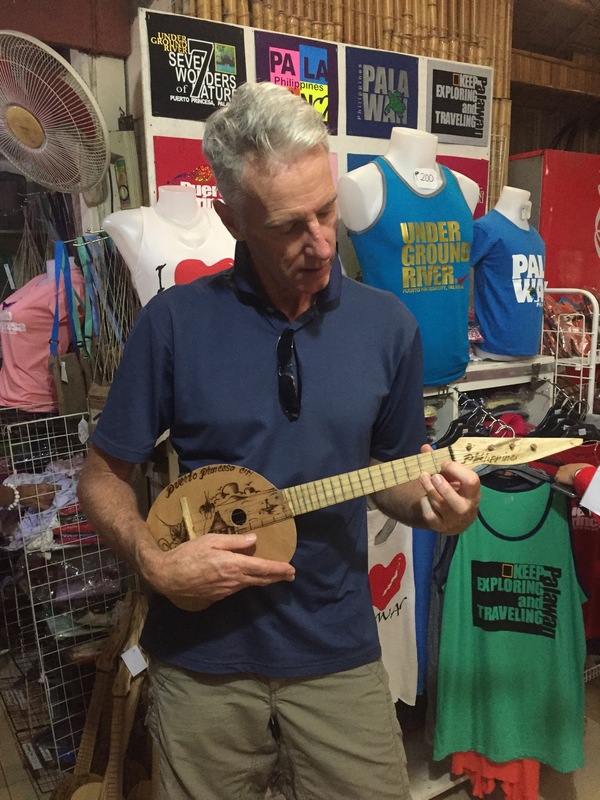 James also found a new musical instrument there.ter the tour finished we asked to be dropped off at the SM mall as we had to finish paying and pick up vouchers for our next adventures in Palawan. We visited a local travel agent in the morning to purchase tickets for the overnight ferry to Coron. We leave midnight Wednesday Nov 1st and arrive at 3pm Thursday. We booked a private cabin and including breakfast and lunch at about $130 Aus we thought good value. We will have a week there and we booked accommodation with the travel agent for Coron and also ElNido where we will take the fast ferry to on the 9th November staying till the 20th when we will return to Puerto Princesa for the fitting of James dental repair, it’s like a crown but not. 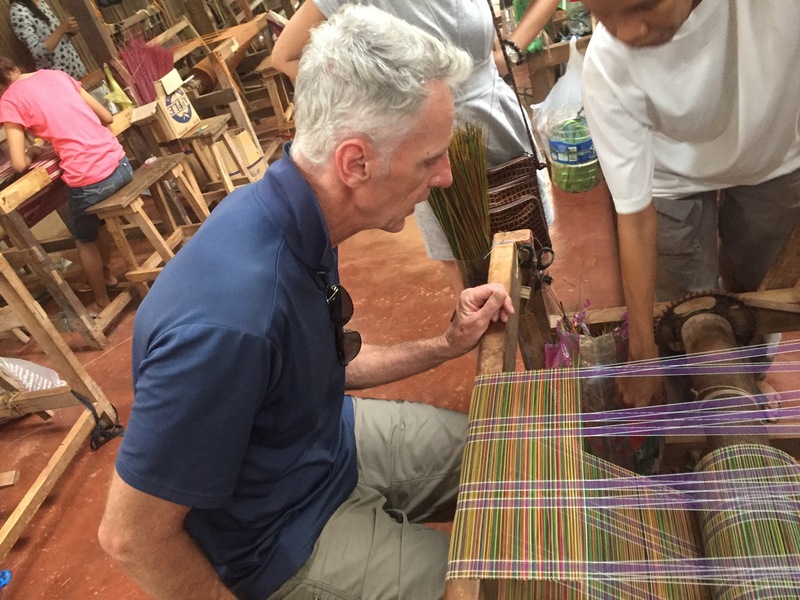 We have filled our time here quite easily as it turns out and are looking forward to the next chapter of our month in the Philippines. On a side note I just had to include this photo of the fridges at the supermarket and how much space is used for hot dogs! The same amount of fridge space is used for all those other incidentals like milk, cheese, yoghurt etc. On a side note I just had to include this photo of the fridges at the supermarket and how much space is used for hot dogs! The same amount of fridge space is used for all those other incidentals like milk, cheese, yoghurt etc. 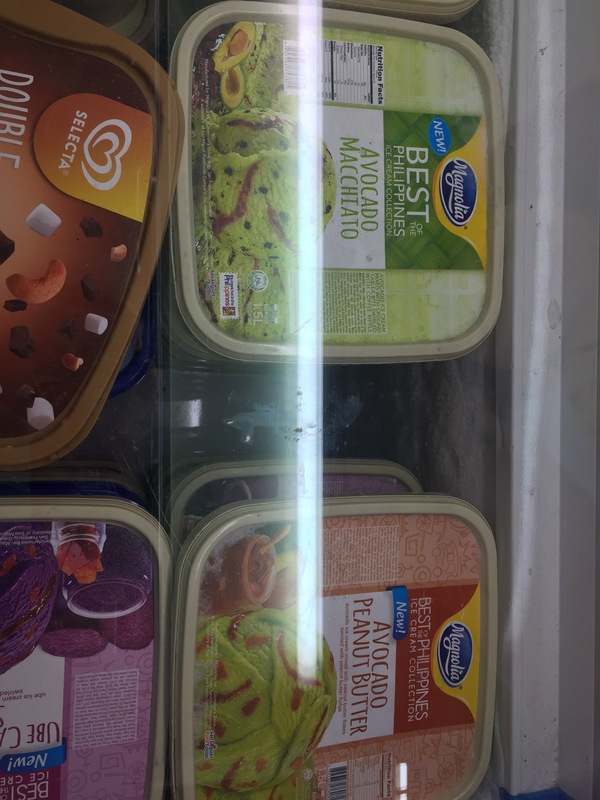 And these new flavour ice creams, avocado macchiato, and avocado and peanut butter, didn’t try either so can’t give it the thumbs up or down.